“Let’s storm the castle!” Nanny Pat took Wilf and Megan off on a big adventure back into the past yesterday. 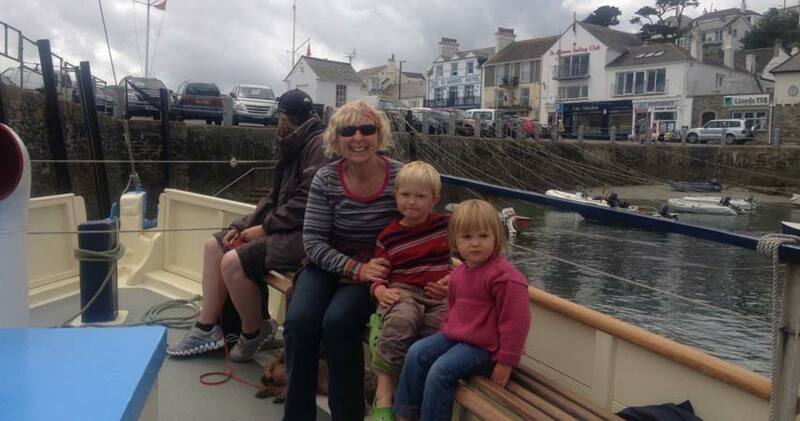 Their trip started in Falmouth, where they boarded the ferry to St Mawes. Richard the ferryman kept the kids amused throughout the 20 minute journey, with his oversized sunglasses, and a range of ‘faces’ that kept appearing in the window, including a smiley face, Winnie the Pooh and more. Their delight kept the rest of the passengers amused too… It was a little thing, but really made the trip memorable! Once back on dry land, it was time to invade the castle! Now managed by English Heritage, St Mawes Castle was built by Henry VIII. It’s one of the chain of forts built between 1539 and 1545 to protect the coast from an invasion by France and Spain. Along with Pendennis Castle on the other side of the Fal estuary, it guarded the important anchorage of Carrick Roads. While it’s not a large castle, St Mawes is very well preserved, and is just right to explore with a couple of under 5s. Wilf was particularly delighted with the garderobe (loo) and the oubliette – a hole-like cell that people were sent to as punishment for misdemeanours. During their visit, the castle came under attack! This time the threat was from the air, rather than the sea, as maurading seagulls swooped down and made off with Wilf’s lunch! There’s plenty of outdoor space to play, burn off some energy or have a picnic lunch, and also a good cafe and gift shop on site. St Mawes Castle is dog-friendly, so it makes a great excursion for the whole family. Nanny Pat’s top tips: Try the audio tour – it’s fantastic, and really helps bring the castle to life. If you’ve got children under 5, it also works out as a good value day out. We loved the play swords in the gift shop – perfect for a little imaginative play – and perhaps fending off the seagulls! The Falmouth-St Mawes Ferry runs regularly from Prince of Wales Pier and Custom House Quay in Falmouth. Check the Fal River website for up to date sailing times and prices. Under 5s go free on the ferry. St Mawes Castle costs £4.40 for adults (£4.00 concessions), £2.60 for children. Under 5s are free.